Both job creation and layoffs are particularly sensitive topics during a weak economy, let alone an election year when candidates all claim to have the best antidotes to put people back to work. So the layoffs of about 200 out of roughly 300 workers at Amonix’s North Las Vegas solar equipment factory this month raised questions not just about the company’s well being but also its promise to bring lots of jobs to the local economy. Through its manufacturing service provider, Flextronics, Amonix cut its staffing at the factory by two-thirds so it could modify the production equipment for making a new product later this year. From Amonix’s point of view, the company, backed by Kleiner Perkins, is doing what is necessary to make a new product that it plans to launch later this year, said Carla Pihowich, vice president of marketing and government affairs, on Tuesday. The plan is to start hiring more people in the second half of this year, she said. “It’s really a temporary scale-down only to scale back up,” she said. The California-based company designs giant solar panels mounted on a mechanical arm to track the sun’s movement throughout the day. Inside each panel is a series of modules that contain lenses that concentrate the sunlight up to 500 times onto solar cells to produce power. 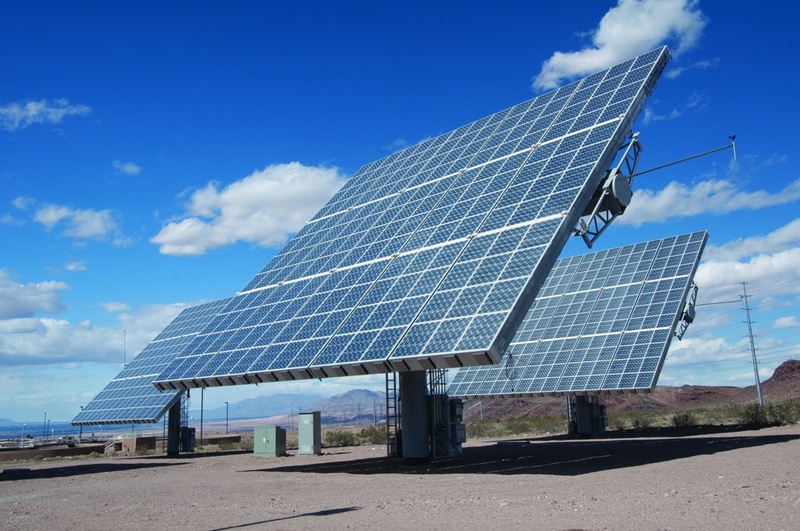 The current panel runs 77-foot by 49-foot and produces 60 KW. Amonix won’t provide details about its new system until it’s ready to launch it, Pihowich said. Factory re-tooling is a common step for any manufacturer who wants to roll out new products, cut manufacturing costs or both. The changes at Amonix’s plan will include “a bit more automation” to make solar energy equipment that will be more efficient at converting sunlight into electricity and cost less, Pihowich said. She also noted that the time is right to make the transition partly because it has completed delivery for a major project – a 30 MW solar farm being built in Colorado by Cogentrix that received a $90.6 million federal loan guarantee. Amonix held an opening ceremony for its $18 million factory only in May last year. So it’s making a big change in staff and machinery only after having operated for a relatively short period of time. That certainly doesn’t look good, particularly when many local and state political leaders who, along with the company, were eager to tout the jobs the new factory would provide less than a year ago. Its then CEO, Brian Robertson, who died during an airplane crash right before Christmas, said at the time that the company had committed to creating 278 jobs but ended up hiring roughly 300 workers for the factory. But will the company re-fill the job count back to around 300? That’s not for certain. Amonix promises to re-hire more people starting in the second half of this year. The number of new hires will depend on sales and shipment demand from customers, but Pihowich declined to give an estimate on how many. For those who felt fortunate to have lined up work at the factory, the layoff announcement was crushing. As Las Vegas Sun reported, some workers felt blindsided by how short-term their employment turned out to be. A local official told the paper that workers were brought on to handle a major project, so the positions were supposed to be temporary. Amonix will need many more large orders to keep its factory going for the long run. The company declined to talk about the status of other projects and contracts, however. It’s worth noting that the company opened the factory during a year when the solar market experienced a glut of conventional solar panels and saw wholesale prices for them falling by 40-50 percent. That affected the sales of other types of solar technologies as well. So if re-tooling the factory and reducing payrolls are necessary to maintain the company’s health and its growth, then they certainly need to be done. But the process comes at the expense of those who were counting on Amonix for more, not fewer, jobs. Unfortunate cuts, but pretty normal in any start-up manufacturing organization. I don’t think it tells you much about the health of Amonix or the solar industry. It’s true that we don’t know any company’s health without seeing its financial statements. But when you open a new factory, you are banking on the equipment to work for you for more than just a year before you have to make any big capital investments there. If you need to lay off 2/3 of your workforce to make capital equipment changes, then the changes are pretty significant. Then the question is: why do you need to do it so soon and for how much? If you don’t actually need to make big equipment changes, then the question remains: why do you need to lay off 2/3 of your workers? No matter what, all these changes affect a company’s financial health one way or the other. a Canadian Company Solamon Energy Corporation is coming to Jamaica to invest some US$440 million in what will be the largest Solar Power Plant in the Caribbean possibly straddling three Parishes!!! An Engineering feat of Power Engineering and a massive employment push for engineers, this project may end up re-employing and retraining the very same people laid off from CLARO who have expertise in installation and setting up Microwave Antennas and Generator Installation!!! check out my article on this electrifying new!!! !